A High Level Panel on Water consisting of 11 Heads of State and a Special Advisor has issued a New Agenda for Water Action calling for a fundamental shift in the way the world manages water so that the Sustainable Development Goals (SDGs), and in particular SDG6, can be achieved. 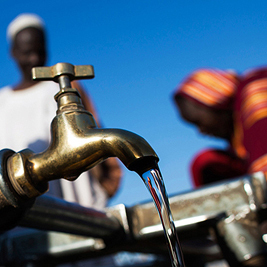 This follows a 2-year mandate to find ways to accelerate solutions to the urgent water crisis. “Making Every Drop Count: An Agenda for Water Action” presents many recommendations as part of an Outcome Report from the Panel, which was convened in January 2016 by the United Nations Secretary-General and the World Bank Group President. The Panel’s report found that the water crisis has many dimensions. Today, 40 percent of the world’s people are affected by water scarcity, with as many as 700 million people at risk of being displaced by intense water scarcity by 2030. More than two billion people are compelled to drink unsafe water and more than 4.5 billion people do not have safely managed sanitation services. Women and girls suffer disproportionately when water and sanitation are lacking, affecting health and often restricting work and education opportunities. 80 percent of wastewater is discharged untreated into the environment and water-related disasters account for 90 percent of the 1,000 most devastating natural disasters since 1990. As part of the recommendations to address these challenges, the Panel is advocating for evidence-based policies and innovative approaches at the global, national and local level to make water management and water and sanitation services attractive for investment and more disaster-resilient. The Panel also calls for policies that will allow for at least a doubling of water infrastructure investment in the next five years. The Panel’s report sets forth a new approach to catalyze change and build partnerships and cooperation, outlining why an integrated and inclusive approach that draws in sectors like agriculture, and other stakeholders, such as city mayors, is needed. The report makes the case that ways of working between, for example, governments, communities, the private sector and researchers, are essential. Also in March, the UN launched a decade for action on water that seeks to forge new partnerships, improve cooperation and strengthen capacity to implement the 2030 Agenda for Sustainable Development. Most directly linked to Sustainable Development Goal 6, safe water and adequate sanitation are indispensable for healthy ecosystems, reducing poverty, and achieving inclusive growth, social well-being and sustainable livelihoods – the targets for many of the 17 Goals.